This species is accepted, and its native range is Tropical & Subtropical America, Tropical & S. Africa, Madagascar. Usually in regrowth vegetation in the forest regions, and in streamside vegetation in the savannah regions. Shrubby climber 2.5–8(–?15) m. high, with a deep brown sharply ribbed stem up to 3.8 cm. wide at base. Leaves imparipinnate, 5-foliolate, (5–)15–25 cm. long, 8–20 cm. wide; petiole up to 10 cm. long, it and the rhachis winged, the wing 0.5–1.3 cm. wide; leaflets sessile or shortly stalked, ovate, elliptic or rhomboid, the terminal one 7–15 cm. long, 3.5–8 cm. wide, the laterals 3.5–10 cm. long, 1.7–5 cm. wide, acuminate, acute or obtuse at the apex, cordate, cuneate or narrowed at the base, subentire (rarely in our area), distantly dentate, serrate or shallowly lobed, subcoriaceous, glabrous, shining, with hairs present beneath on the venation and in tufts in the nerve axils; lateral nerves strong. Inflorescence a racemoid thyrse axillary in each of the upper leaves, 5–10 cm. long; peduncle 1–3×the length of the fertile portion, with apical pair of tightly coiled tendrils, or occasionally inflorescence sessile; inflorescence-axes brown-puberulent; pedicels 0–3 mm. long; flowers (3–)5–9 in cymose clusters, the terminal one often female and the remainder male. Flowers yellowish, creamy white or pink, scented, 5–6 mm. long; sepals ovate, unequal, outermost 1.5 mm. long, innermost 4 mm. long, pubescent on their outer surfaces; petals white, tongue-shaped, subequal, 5 mm. long, scale asymmetrically crested, ciliate, 3/4 of the length of the petal, yellow-tipped; disk to one side of the androgynophore, ciliate, consisting mainly of 2 large, plus 2 minute, ear-shaped glands. Stamens 8, 5 long and 3 short; anthers white; staminodes 8. Ovary pubescent; style trifid; rudimentary ovary much reduced. Fruit green, turning red or rose-red, obovoid or obovoid-oblong, 2.4–3.6 cm. long, 1.1–1.4 cm. wide, rounded or emarginate at the apex, mucronate, strongly narrowed at the base, 3-grooved, at first pubescent but later glabrous and finely rugulose, ultimately dehiscent. Seeds black, oblong-ellipsoid, 1–1.1 cm. long, 7–8 mm. wide; aril white. Forest margins, gallery forest, moist thicket and scrub; 0–1600 m.
Liane or scandent shrub; branchlets pubescent. Leaves up to 30 cm. long (usually c. 12 cm. ); stipules 4–5 × 1–1·5 mm., narrowly triangular, pubescent; petiole up to 10 cm. long, winged, pubescent; rhachis with wing up to 8 mm. broad; petiolules 1–3 mm. long, pubescent; leaflet-lamina up to 16 × 9 cm., ovate or elliptic or obovate, pubescent or pilose on the nerves but otherwise nearly glabrous, apex usually acuminate, margin dentate to subentire, base cuneate; lateral nerves 7–9 pairs. Inflorescence an axillary paniculate thyrse, floriferous portion usually c. 5 cm. long, tendrils c. 2 cm. long when coiled (sometimes absent); peduncle up to 11 cm. long (occasionally very short), minutely pubescent. Flowers white; pedicels up to 4 mm. long. Sepals 1·5–3 mm. long, the larger ones elliptic, the smaller ones subcircular. Petals 4 × 2 mm., narrowly obovate, unguiculate, with a large ciliate scale attached to the claw. Stamens unequal; filaments 2–4 mm. long, pilose. Ovary 3-gonous, shortly stipitate, appressed-pubescent; style 3 mm. long; pistillode 1 mm. long in male flowers. Fruit up to 28 × 12 mm., narrowly obconic, 3-gonous, apiculate, shortly stipitate, glabrous. Seed blackish, 12–15 × 6–8 mm. Nativa en Colombia; Alt. 0 - 1450 m.; Llanura del Caribe, Pacífico, Sierra Nevada de Santa Marta, Valle del Magdalena. Araújo, D. & Alves, M. (2010). Climbing plants of a fragmented area of lowland Atlantic forest, Igarassu, Pernambuco (northeastern Brazil) Phytotaxa 8: 1-24. Schnell in Ic. Pl. Afr. 36. Agnew, A.D.Q. & Agnew, S., Upland Kenya Wild Flowers, ed. 2: 164 (1994). 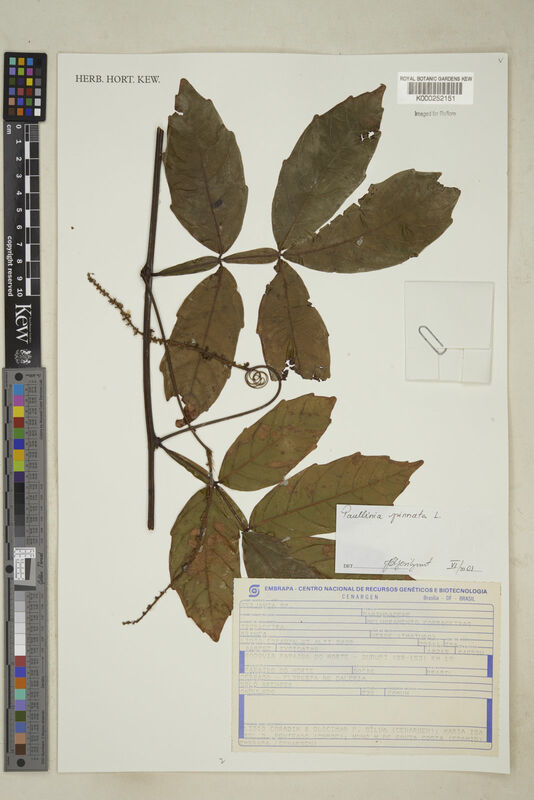 Beentje, Kenya Trees, Shrubs and Lianas p. 423, fig., map on 422 (1994). Vollesen in Fl. Ethiopia 3: 493, fig. 125.5 (1990). Troupin, Fl. Rwanda 2: 310, fig. 96/2 (1983). F.G. Davies in Kew Bulletin 32: 429–431 (1978). Fouilloy & Hallé in Fl. Gabon 23: 13, t. 1/1–9 (1973). Exell in Flora Zambesiaca 2: 512, t. 102 (1966). Haerdi in Acta Trop., suppl. 8: 124 (1964). F. White, Forest Flora of Northern Rhodesia p. 225 (1962). Hauman in Flore du Congo Belge et du Ruanda-Urundi, 9: 283 (1960). Keay in Flora of West Tropical Africa, ed. 2, 1: 710, fig. 196 (1958). Exell & Mendonça, Consp. Fl. Angol. : 73 (1954). F. W. 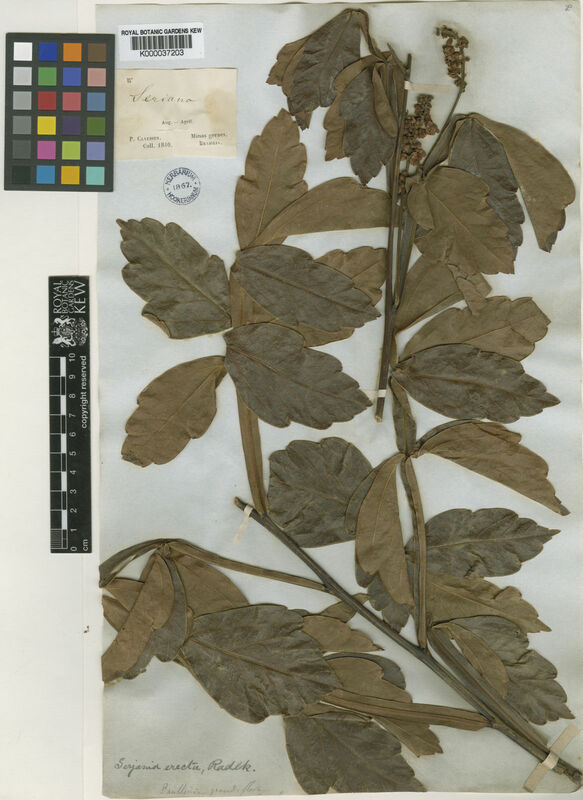 Andr., The Flowering Plants of the Anglo-Egyptian Sudan 2: 343, fig. 127 (1952). R. O. Williams, Useful and Ornamental Plants in Zanzibar and Pemba p. 401, fig. on 403 (1949). Robyns, Flore des Spermatophytes du Parc National Albert 1: 514 (1948). Radlk. in A. Engler, Das Pflanzenreich IV, 165: 247 (1931). Taub. in Die Pflanzenwelt Ost-Afrikas und der Nachbargebiete, Theile C: 249 (1895). Baker in Flora of Tropical Africa 1: 419 (1868). L., Sp. Pl. : 366 (1753).